What is a bridge plate? 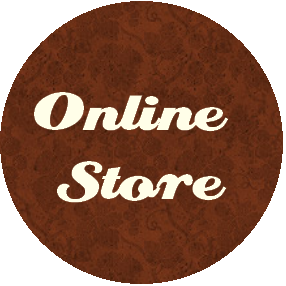 The bridge plate is a flat piece of timber or in some cases (i.e. Maton guitars) a laminated piece of timber that is glued to the underside of the sound board directly under the bridge. Its primary function is to provide a strong anchor point by which the string tension is dispersed to the soundboard’s bracings and keep the soundboard flat in the area directly surrounding the bridge. Fact 1. Without the bridge plate the bridge would simply come away from the guitar and no amount of re-gluing would keep it on. Fact 2. Even the strongest bridge plate will wear over time as a result of many string changes and general wear and tear. Fact 3. The bridge plate is also a very crucial component tonally. If the bridge plate is worn, warped or delaminating, the string vibration will not resonate efficiently into the soundboard. A common complaint we hear is that of dead sound, muted/no midrange or lack of volume. By replacing or reinforcing the bridgeplate with the correct timber you can effectively bring back life into even a cheap guitar. See below for detailed pictures. The other important part of a soundboard’s reinforcement are the bracings or ribs. These also hold the soundboard flat under the tension of the strings. 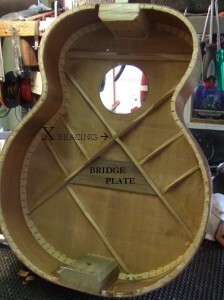 The X bracing is the largest of these and is as important to an acoustic guitar as the thigh bone is to your leg. Without these bracings (both large and small) the guitar would fall apart. They are also vibration distributors and in their own way serve a similar purpose as the bridge plate. See below for detailed pictures.